A's & Aces is a 501 (c) 3 nonprofit organization founded in 2008 with a mission to provide academic assistance, life skills and tennis to New Orleans public school children and others who lack access to high-quality academic assistance and tennis. Our sport-based youth development model is used to expose and engage many, and retain all youth with high interest and a committed parent who want to succeed by using tennis to assist their pathways to college and beyond. The A's & Aces program uses a “playing pyramid” with mass community outreach at the bottom, a pathway of developmental tournament training programs in the middle and an elite high-performance group emerging at the top. A’s & Aces’ programs are designed for different age groups and experience levels, and are adjusted to fit varying time frames and facilities. Nonetheless, all levels have elements of tennis, life-skills and academic support. 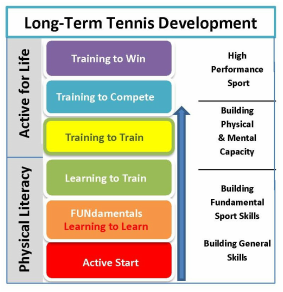 Our most complete in-school model includes literacy and life skills activities in our “A’s” classroom, and physical literacy/ tennis activities on the courts in our “Aces Tennis Lab." Our after-school programs and Summer Literacy and Tennis Camps also divide participants into two groups that split equal time in the classroom and on the courts. Even programs ostensibly implemented with tennis only, like our early elementary school PE classes, our Saturday tennis clinics and Tournament Team practices, introduce vocabulary-building words and academic “cross-curricula” concepts (geometry, history, etc.) to explain tennis strokes and strategy, and emphasize sportsmanship, conflict resolution, nutrition, and other life skills. This is an A’s & Aces’ literacy and life skills curricula based on Mind in the Making: The Seven Essential Life Skills Every Child Needs. For three reading levels, children’s books with lesson plans relating to each of the 7 life skills are used with K-3rd grade. The NJTL Life Skills Curriculum utilizes tennis to empower youth with the skills, values and experiences they need to become responsible and successful citizens. Children participate in Game, Set and Match levels, each featuring 6 life skills topics and multiple games and projects to implement them. Successful completion of the activities provides an opportunity to earn a certificate at each level. Campers are required to have a library card and select books relating to each of the 7 weekly themes that they are interested to read. The weekly themes are broad (sports, weather, animals, etc.). These books, along with age-level, theme-related “words-of-the-day,” are used in conjunction with camp literacy projects. A's & Aces promotes wellness and healthy lifestyles by teaching physical literacy, life skills and tennis. Tennis is a life-long, non-contact, low impact, social, global, individual and team sport played by both genders separately (and together in mixed doubles) from beginners to the highest levels of professional competition. The USTA hosts competitions for junior age divisions from 8s to 18s in 2 year increments, and ranks adult players in five-year age increments through the age 90 and over division, for men and women, in singles and doubles. The game of tennis is also a platform for developing life skills. Through tennis, we cultivate character, build confidence, foster sportsmanship, promote tolerance, emphasize best effort, and teach teamwork and conflict resolution skills. These are essential life skills that are needed on and off the court throughout life. Tennis is a great way to improve physical literacy. In fact, many consider tennis to be the "best first sport” for children due to the game's wide array of skill sets that cross over to other sports: running, catching, striking, 3-step movement patterns, aerobic, anaerobic, and team building, plus the ability to play the sport for a lifetime. 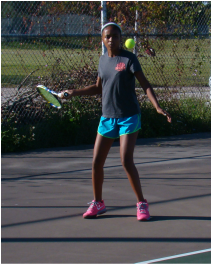 Since no NORD tennis courts had yet re-opened in post-Katrina New Orleans, in 2008 A’s & Aces began programming by using a mini-sized version of the sport with children in grades K-3. Similar to baseball’s use of T-ball, and the Bitty Basketball and Pee Wee Football formats of those sports, a child-sized version of tennis became popular as a way to introduce the game to children in Europe. 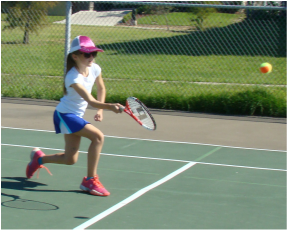 A’s & Aces began to use “QuickStart Tennis” on school playgrounds, gyms and cafeterias. Introducing tennis to excited groups of young students on school courts is aided by use of non-traditional, adaptive measures. To earn use of a racket each child must demonstrate safe behavior by learning to toss, move and catch cooperatively. They then learn the names of lines, rules, scoring, and basic strategy, by playing “Toss Tennis” competitively. At that point they can earn a foam sleeve paddle that is used like a large hand-racket. 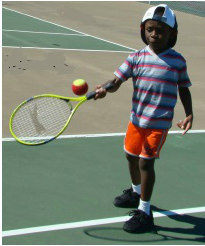 A child can begin using a racket when the coach believes that player is ready to safely use it. - The height of the nets. Racquet control is essential to succeed at tennis. Adult sized racquets are too long and heavy and their grips are too large for children to use. A mix of 19-, 21-, 23- and 25-inch tennis racquets are used to ensure that the appropriate racquets are being used by our red and orange ball players who range in age from age 5-10. Children need a ball that is sized and paced to their playing abilities. A regular tennis ball moves too fast, bounces too high and is too heavy for the smaller racquet. . Each age group uses specific kids’ tennis balls best suited to their size and playing ability. For kids 8 and under, a very low-compression red felt ball that moves slower, bounces lower and travels less distance is used. For ages 11 and older, the green felt ball has a slightly reduced bounce than the yellow tennis ball. These changes now enable many Kindergarten – 3rd grade students to start playing tennis almost immediately. Like other popular youth sports, QuickStart Tennis stresses the fun associated with actually playing the game of tennis and getting involved in team competition. All players, regardless of age, start on the 36' court with larger red balls ( foam or low compression felt). The court is 36' x 18' and is laid out perpendicular to the net on a regular court. The regular doubles sidelines become the baselines for this official 8 & under format for USTA competition. A 23" or shorter racket is mandatory. Scoring is simple: best of 3 games, each game is first to win 7 points. When ready, players graduate to the 60' court with orange, low compression tennis balls. The singles court is 60'x21' and is played inside of a regular court. 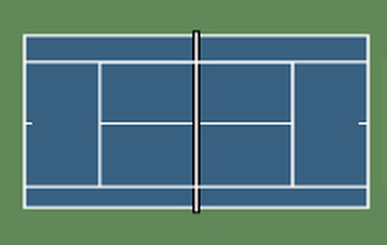 For doubles, the dimensions are 60'x27', using the regular court singles lines as the doubles line. A 25" racket or shorter is mandatory. For competition, this court is limited to children 10 and under. Scoring uses short sets to four games. Players graduate to the full 78' court with "green dot" balls that are only slightly less compressed than yellow balls." And finally to the yellow ball.